November 5th, 2018 – Toronto, Ontario: Royal Road Minerals Limited (TSXV:RYR) (“Royal Road” or the “Company”) is pleased to provide an update on its gold and copper exploration activities in Colombia. Royal Road is the largest application holder in Colombia’s Nariño Province with in excess of some 350,000 hectares under Concession Contract application. Nariño is widely considered to be one of the last remaining, highly prospective and under prospected regions of the Andes mountain chain. The province hosts numerous high-grade gold occurrences and a largely unexplored porphyry copper belt, which was identified by the Japanese International Cooperation Agency in the 1980’s (Figure 1). Royal Road is a signatory to the British Embassy’s Peace and Business Initiative and is committed to aligning its exploration and development activities with the post-conflict aspirations of the Colombian Government and the international community. In December 2017, Royal Road executed a landmark Collaboration Agreement with ECOMUN (see Press Release December 18, 2017), a body established in May 2017 under Presidential Decree and in accordance with the terms of the final peace agreement executed between the Colombian Government and FARC-EP in November of 2016. The Collaboration Agreement establishes the terms and conditions under which ECOMUN will assist the Company in attaining a social license for exploration and mining projects which are environmentally responsible and socially sustainable and which contribute to the reincorporation of ex-combatants and the development of local communities. As anticipated under the terms of the Collaboration Agreement, ECOMUN and Royal Road have established a Management Committee, comprising two representatives from each party and an Independent Chairman. Dr Alvaro Leyva has been appointed to the role of Independent Chairman. Dr Leyva is a lawyer and economic scientist; he was formerly a government minister and Senator in the Colombian Congress and since 1980 he has played a pivotal role in peace negotiations between the Colombian Government and armed guerilla groups including, M-19, FARC-EP and the ELN. The Management Committee has established Community Liaison Committees (CLC’s) in each of the eleven municipalities covered by Royal Road’s applications in Nariño and the CLC’s have in-turn coordinated community and indigenous community consultations in various of these municipalities with a view to securing permissions for the Company to commence regional drainage geochemical exploration and negotiations on existing mine occurrences. 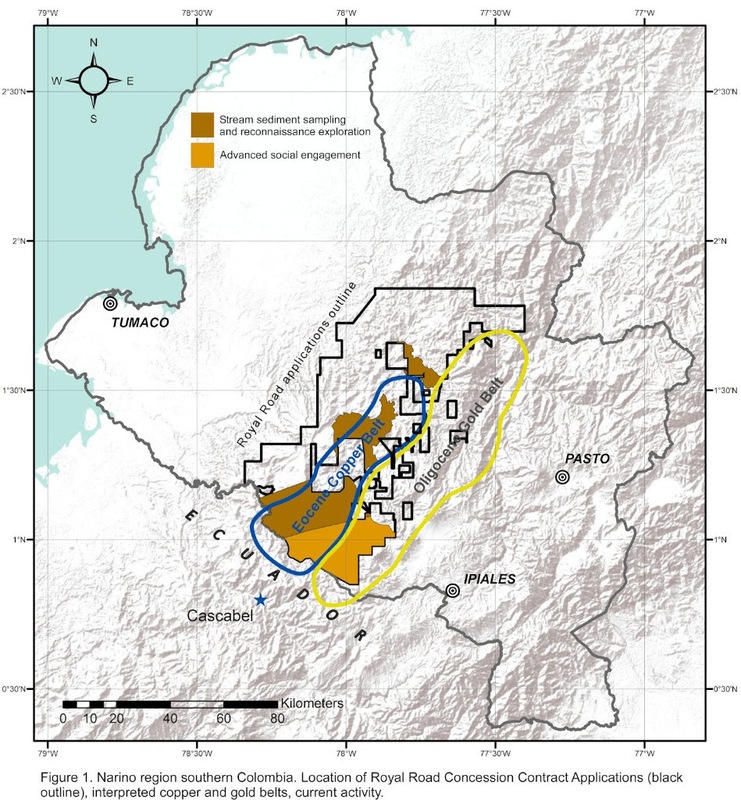 In general, Royal Road’s current exploration activities in Nariño are focused on reconnaissance exploration and drainage geochemical sampling for porphyry copper and gold targets (see Figure 1) and on joint-venture and acquisition opportunities for gold only targets.